For those not familiar with the Swiss-brand of On running shoes, the models’ appearance may come as something of a shock at first glance. After all, what are these “clouds” that make up the sole of the shoe and what do they do? The four shoes that make up the brand’s range are: Cloudster (a beginner and everyday shoe), Cloudrunner (high-impact runs on and oﬀ -road), Cloudsurfer (performance shoe for training and racing) and the Cloudracer (lightweight competition-only model). Refreshingly, each shoe comes with an advisory target speed and this leaves the buyer in no doubt as to what and who the model is designed for. 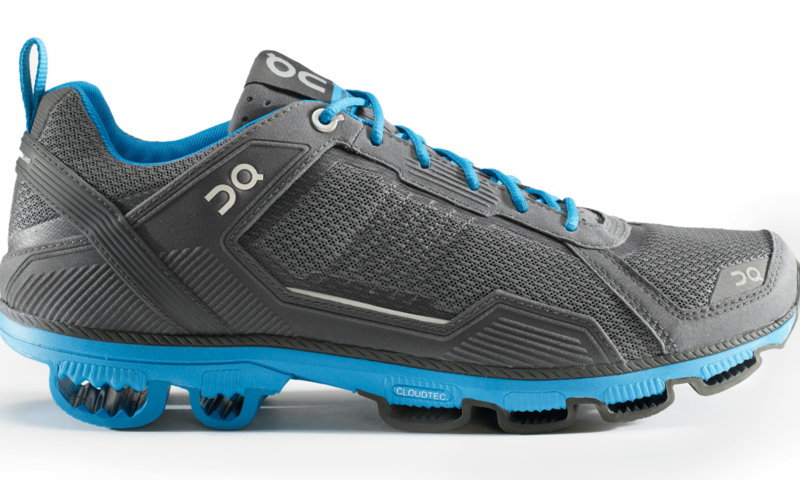 We were given the task of testing the 2013 Cloudrunner shoe and our tester had previously put older models through their paces. The first thing he noticed was that there were more clouds on the sole (15 in total) and that these were placed nearer the heel and toe-off areas, which he thought gave a much better feel on the run. Putting on the shoes for the first-time may leave the runner feeling somewhat unsure as to how they will feel and respond. However, for those expecting a bouncy feel, the realisation will be unfounded – they feel firm with the clouds absorbing the shock of the pavements while giving a very neutral ride. Are these shoes for elite athletes? Probably not. After all, it states on the box that they are designed for runners who propel themselves along the pavements and roads as well as some off-road jaunts at a sedate 8-9:30mile – in fact, most of the not-so-serious running population. Although looking a tad “space-age”, it doesn’t actually feel that different once out on the run. Our tester’s first trek was a six-miler on pavements and parks. He said: “They didn’t take any breaking in and, although they felt slightly different from my regular trainers, no problems were encountered and there were no aches the following day. One thing is guaranteed with On shoes and that is quality and comfort. They come in men’s and women’s colourways and importantly are available in half-sizes for that perfect fit. They are not cheap at £125 but are worth a try, especially if most of your running is done on hard surfaces. They weigh in at 270g and with a heel-toe oﬀ set of 7mm.